Straight for Equality invites you to join the growing number of PFLAG Chapters across the country who are using the Straight for Equality program to bring the message of PFLAG to new audiences in their communities. We all know people in our lives that support equality for lesbian, gay, bisexual, transgender, and queer (LGBTQ) people but aren't sure how to express their support in a consistent and meaningful way. Through the Straight for Equality program PFLAG members have the ability to break down the barriers that keep people from getting involved in LGBTQ issues and to support them as they learn more. 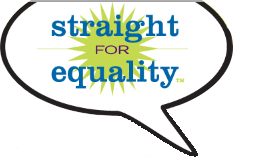 We have some great tools to help you learn more about the Straight for Equality program, how you can use it in your chapter, and much more. We'll help you consider how the ways you approach support, education and advocacy, the language you use, and your expectations of new allies can make a difference in engaging new people in the fight for equality. Our experience and research has taught us some things to avoid when working with allies that will help you to effectively invite, educate, and engage them in new and exciting ways. PFLAGers are the original allies, and now you're leading the way in creating a new generation of allies. We're glad that you're here to be part of the effort. We couldn't do it without you.